Portfolio company Bitstamp, one of the longest-standing bitcoin exchanges and the leading Europe-based bitcoin exchange, announced today that Luxembourg has granted the company a license as a fully regulated Payment Institution. The license has been signed by Luxembourg’s Minister of Finance Pierre Gramegna. Bitstamp will become the first fully licensed bitcoin exchange in Europe, going into effect on July 1st, when the company will be fully operational from their new headquarters in Luxembourg. The news is the result of a rigorous two–year application process with the Luxembourg financial regulator, the Luxembourg Financial Industry Supervisory Commission (known as CSSF), which included government security reviews in addition to a third-party audit by Ernst & Young Luxembourg. Bitstamp’s license is passportable into all of the 28 E.U. member states, enabling all Europeans with a robust, secure platform for bitcoin trading. In effect, Bitstamp is the first bitcoin/blockchain company to be fully regulated E.U.-wide. In addition Bitstamp has simultaneously launched EUR/BTC trading to better serve European markets. Bitstamp is offering free trading in EUR/BTC for both new and existing customers for the next seven days. Bitstamp’s decision to headquarter in Luxembourg comes from the country’s long and established history of fostering innovation. A historical leader in e-payments and data privacy as well as the European headquarters for many global players including Amazon and PayPal, Luxembourg features an exceptionally strong infrastructure and the financial and security awareness Bitstamp initially sought. Having broken major ground today, Bitstamp becoming the first nationally regulated bitcoin exchange is a historic achievement for the digital currency and blockchain industry. When Pantera first invested in Bitstamp in 2013, the digital currency industry was a virtual Wild West — a promising frontier, yet unregulated and uncertain. Today’s announcement represents a major step in the industry’s maturation. Luxembourg recognizes the economic potential of nurturing bitcoin and blockchain as per its enthusiastic coordination with Bitstamp these past two years. It has set a resounding example for other nations to embrace this technological innovation. I’m proud of the work Bitstamp has done to receive this license and proud of how far the industry has come. This announcement marks the latest demonstration of Bitstamp’s commitment to be at the forefront of regulatory compliance. Bitstamp has led the bitcoin industry on several key security and regulatory decisions, including being the first bitcoin exchange to require full Anti-Money Laundering/Know Your Customer protocols and to implement highly secure multi-signature accounts. New and current Bitstamp customers can now use the platform knowing that the company and its services have achieved the highest levels of security and consumer protection previously only recognized in traditional financial institutions. Increase in general consumer confidence. One of the purposes of regulation is to ensure that consumers and investors can consume and invest in products safely. Bitstamp’s successful licensure will increase the confidence consumers and investors have not only in Bitstamp’s products, but also in digital currency and blockchain-related products and ventures generally. Increased incentive for governments to get pro-active about regulating and nurturing the digital currency and blockchain industry. As an investment firm focusing exclusively on digital currency and blockchain, we believe this industry has the potential to be immensely valuable in the future. Governments like Luxembourg are beginning to recognize this potential future value too. Countries playing host to major blockchain industry epicenters in the future may prove lucrative for their economies. Governments may feel pressure to compete after announcements like these by similarly enabling the industry, a clear benefit. Further maturation of the industry. Concerns whether digital currency and blockchain are regulatorily kosher are subsiding as a result of new licensure processes, clarifications, and publicized regulator sentiments. While much of the regulatory climate is still taking shape, Bitstamp’s licensure indicates that this historic reservation towards the industry can and will be overcome. We’re eager to see what lies ahead for Bitstamp, bitcoin, digital currency, and blockchain post this regulatory epoch of the technology’s lifetime. Clarification about the rules and companies in the space formally following them will facilitate new entrants and better productivity in the coming years. After fluctuating around $420 for that past month, the price of bitcoin passed $448 for the first time in two months on April 21. Bitcoin one-year volatility continues to achieve new all-time lows. Bitcoin volatility — which used to be off the charts — is now below many major assets. Bitcoin is becoming a “normal” currency. Bitcoin transactions per day are still rising in tandem with price. Increasing real-use of the Bitcoin network may have resulted in a sustained price increase. Price is catching up with Bitcoin’s underlying fundamentals. Should price continue to appreciate at the pace with the historical compound annual growth rate of transactions per day, bitcoin price will surpass the previous December 2013 all-time high in January. 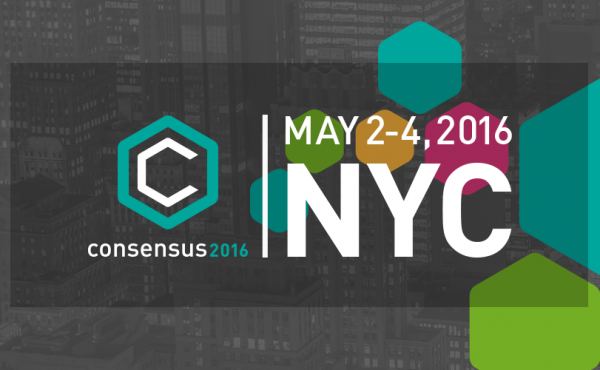 This May 2–4, professionals from leading blockchain, finance, and tech industry startups, investment firms, financial services institutions, academic and policy groups will congregate at the New York Marriott Marquis for Consensus 2016. The multi-day event will define what is “real” in blockchain technology and focus on how to mainstream real-world applications for consumers and enterprises alike. Join us as Pantera CEO Dan Morehead will be speaking on the Proof-Of-Work Pitch Competition on May 3rd. Several of our team members will be on the ground too. If your interested in meeting up in New York, contact us at (415)-360–3600 or via ir@panteracapital.com. For more information about the event: http://www.coindesk.com/events/consensus-2016/. If you are interested in a meeting, please contact Pantera’s investor relations team at 415–360–3600 or via ir@panteracapital.com. Excerpts: “Bitcoin mining company BitFury, the Republic of Georgia’s National Agency of Public Registry and renowned Peruvian economist Hernando DeSoto will announce Friday a partnership to design and pilot a blockchain land titling project. Is Bitcoin Becoming More Stable Than Gold? Excerpts: “…Since its inception several years ago, bitcoin has seen wild prices swings as advocates have tried to establish the nascent technology as a widely-used digital currency. But for the past three weeks, the price volatility of bitcoin has remained below or equal to that of safe-haven gold, according to data analysis from FactSet and CoinDesk. “The last 24 days mark the longest period in which bitcoin prices have been less volatile than gold prices, going back to 2010. Some point to the drop as a sign that investor perception of bitcoin is drawing closer to gold as a safe store of value. “Gil Luria, a managing director at Wedbush Securities who covers e-commerce and payments, said that as bitcoin has gathered steam, it’s taken on a similar role to gold. Holding bitcoin or gold can appeal to a coinciding demographic of investors, since both may be used as an alternative when investors lose faith in traditional asset classes. Excerpts: “…Amidst block size debates and proclamations that Bitcoin is dead, we’re glad the first action we took was to offer positions in a neutral academic environment at the MIT Media Lab to Wlad, Cory and Gavin to continue their open-source development work on Bitcoin. “When we offered these positions, we heard from companies and individuals with offers of financial support, which led to the creation of the Bitcoin Developer Fund. The goal of the fund is to cover salaries, travel and overall support of Bitcoin protocol development efforts, including events like the Scaling Bitcoin workshop series. Excerpts: “Barclays is linking up with Circle Internet Financial, a US mobile payment start-up backed by Goldman Sachs that uses bitcoin to transfer central bank currencies, as digital money increasingly moves into mainstream finance. “It is the first time a European bank has allowed a digital currency company to use its infrastructure — enabling it to transfer sterling and euros — according to the two companies…. “…From Wednesday the payment app — which transfers dollars by first converting them to bitcoin — will also be able to transmit sterling between users of the app by linking to their debit cards. We tweet blockchain news and insights on Twitter and Medium at @PanteraCapital and@Dan_Pantera. Blockchain Public Letter: a monthly letter with our thoughts on significant market and ecosystem-related developments. Also includes our thoughts on blockchain venture capital and news on our portfolio companies for accredited investors. Blockchain Investor Letter: Blockchain Letter plus exclusive information for accredited investors. White Papers: periodic, original blockchain research and academic papers. Portfolio Company Profiles: inside looks into some of our portfolio companies, featuring our perspectives and overviews of each company’s industry positioning. Most of our content is publicly available at www.panteracapital.com/research. However, the SEC mandates that only accredited investors can access certain information. If you are an accredited investor, register here to access restricted content.